I have a friend whose godmother came to visit from far, far away. 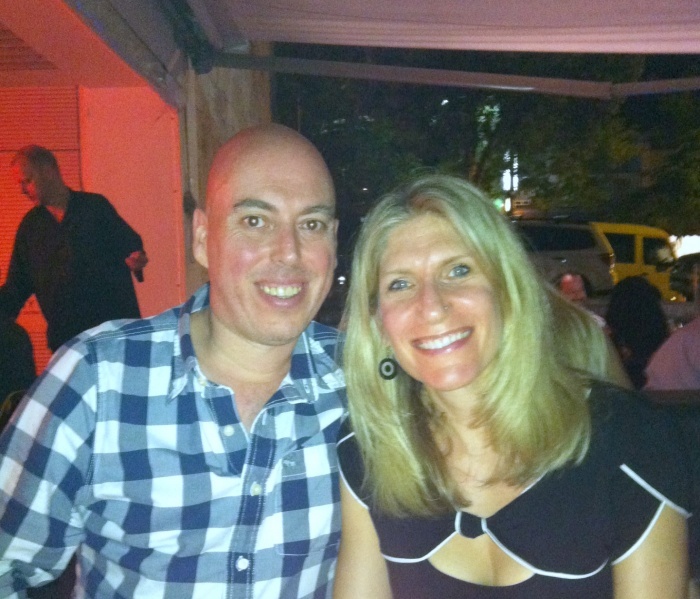 She wasn’t a fairy godmother, but she was a very rich godmother, and treated my friend to some fantastic feeds at the very best restaurants in town. As a result, my friend is something of a walking Good-Food-Guide and whenever I ask her which is her favourite fine dining establishment of all, she always says Universal. In fact, she likes it so much, she’s been back, more than once! So when David and I decide a few months ago to celebrate our anniversary in style, we know where we want to go! 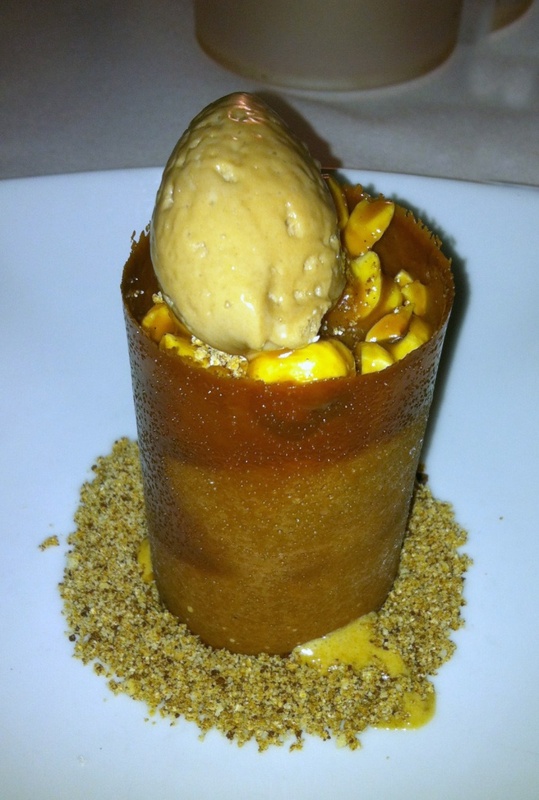 I was sold on the place when I saw the owner/head chef Christine Manfield do that mind-blowingly delicious dessert on Masterchef Australia called Gaytime goes Nuts. That plate of perfection has my name all over it! You may be thinking that we only celebrated our anniversary in February, in style at Quay, but that was our wedding anniversary, and tonight we celebrate the day we met. Any excuse goes in our house! The menu is mouth wateringly good and as the waiter explains, it’s a kind of DIY degustation. The dishes are ordered from the lightest to the fullest and richest flavour. He suggests 3 savoury plates and 1 dessert per person. Well, I decided on dessert before I even made the reservation, so it’s just the savoury stuff to sort out. Everything looks so delicious, it’s really hard to decide. There’s a complete and comprehensive list of veggie options too. Even though I am a meat-loving-missy, it’s nice to see that vegetarians are so well taken care of. I love it when the waiter tells us that the plates are not designed for sharing as mixing the balance of flavours will mess with your palate. Tonight, I am a plate hog and I’m loving it! I kick off proceedings with the lightest dish of all, the prawn and coconut ceviche, green chilli salsa topped with palm sugar popcorn. The dish looks as pretty as a picture and tastes amazing! 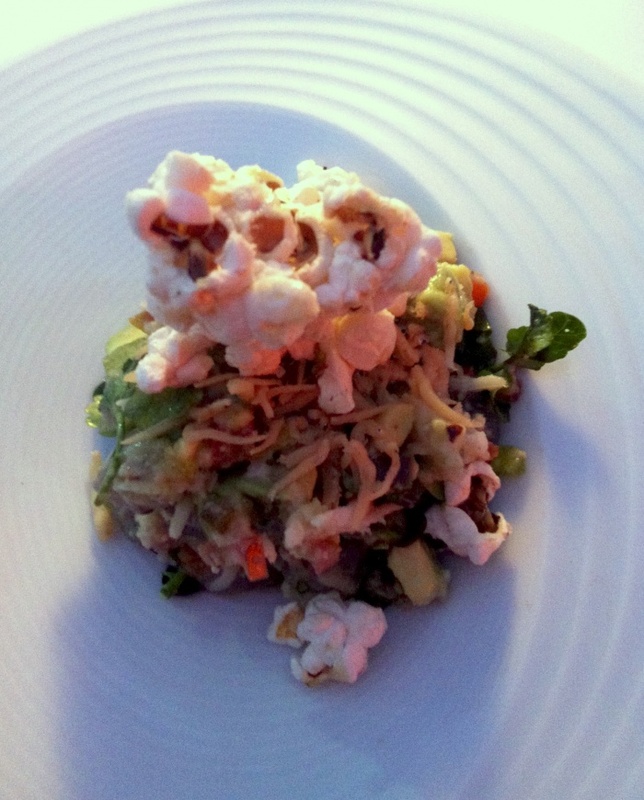 I love the feel of the different textures, the chewiness of the prawns and the crunchiness of the popcorn. The flavours are spot on too, the heat of the chilli is perfectly balanced with the sweetness of the coconut. David is being the ultimate carnivore and is eating meat for all three savoury plates. 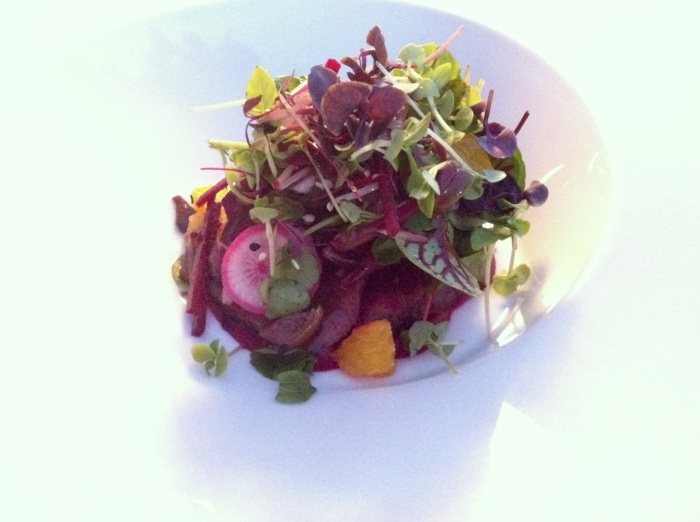 He starts with the rare roasted venison, toasted sesame, chocolate, red miso, black olives, pink turnips and beetroot. I should have chosen this dish because it looks so pretty in pink. The beetroot puree is so colourful and the meat literally melts in the mouth. We can’t wait for the second plate. 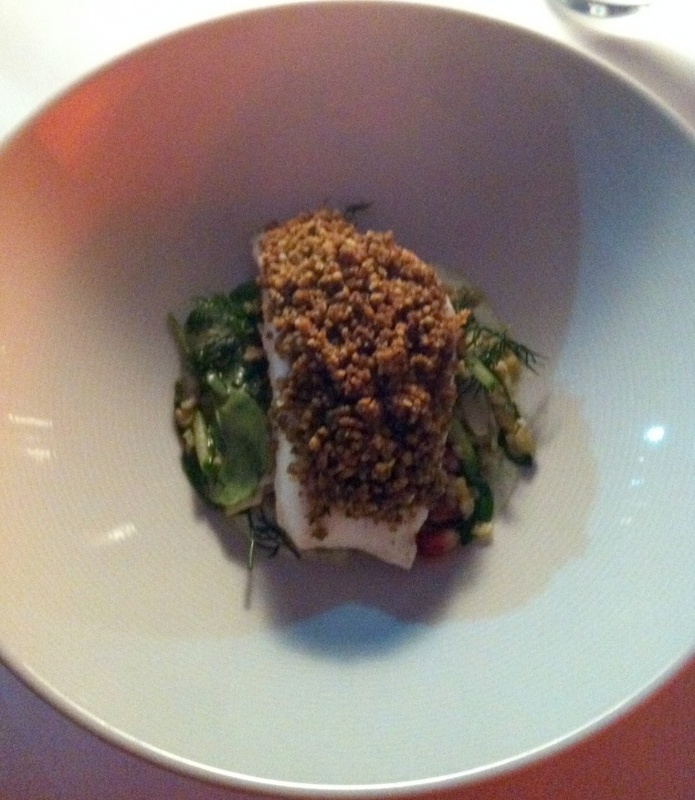 I choose the steamed snapper, toasted walnut crumble, coriander yoghurt relish, freekah with pomegrante and cucumber. The fish is cooked to perfection and the crumble is so crunchy. It sounds as good as it tastes. The yoghurt relish is really refreshing and the pomegranate sharpens up the dish nicely. This is one of those dishes that looks so beautifully simple, yet really is thoroughly complex. David is blown away by his slow braised rabbit, chorizo and celeraic, swiss chard and gruyere cloud. He has only one word for it “sublime.” If it tastes as good as it looks, this dish is sure to be a real winner. Irresistably good. There’s a pleasant pause inbetween plates, just enough time for your tastebuds to regroup, so that you’re almost begging for more! 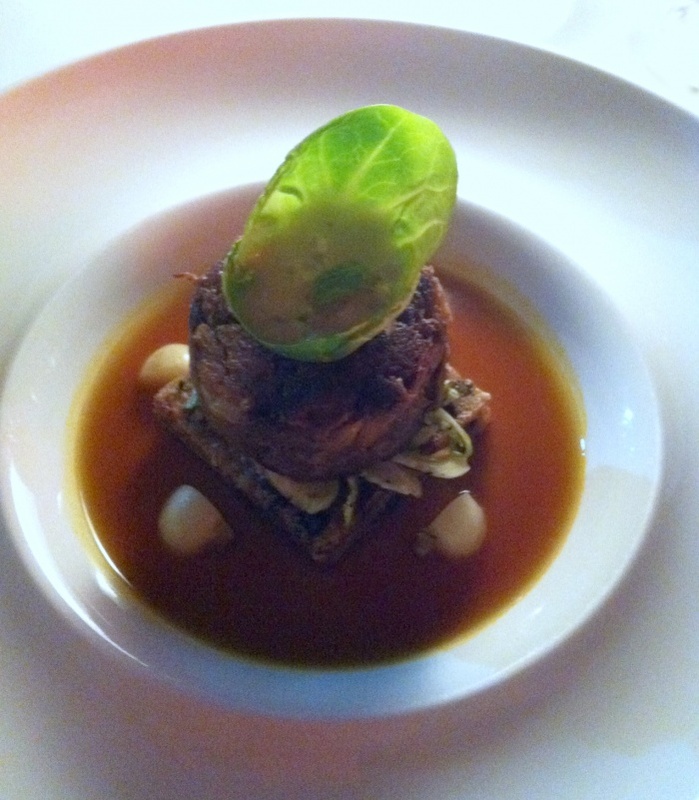 I take a walk on the wild side with my third plate and choose the braised veal shin, fried turnip cake, kimchi broth, brussel sprouts and oyster vinaigrette. This is a brussel sprout but not as you know it. So fine, so pretty and so delicate in flavour. The kimchi broth gives the dish a bit of a kick, and I love the texture of the meat, the tasty turnip cake and the light broth together. 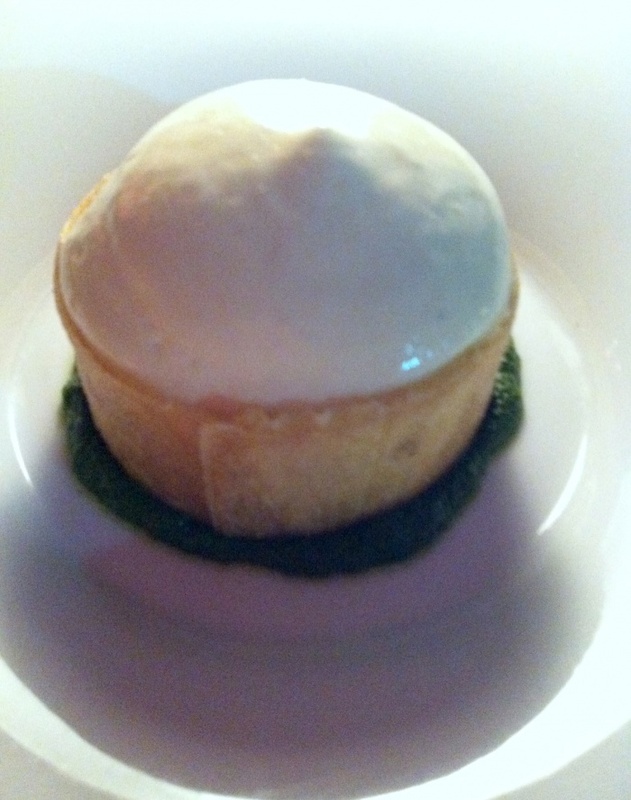 As the waiter so rightly points out, this dish being the last but one on the menu is deliciously rich. David can never pass up a plate of pork belly and tonight is no exception. 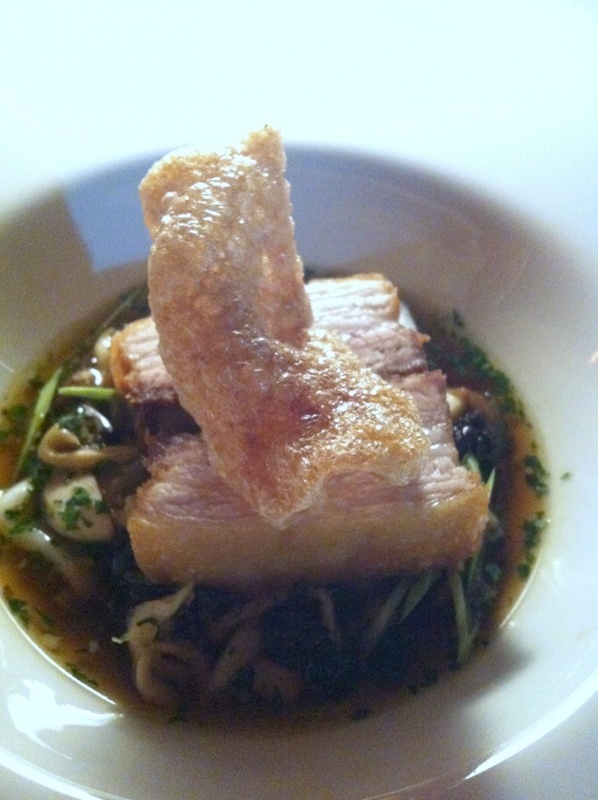 He’s not disappointed with his soy braised pork belly, squid, garlic mushrooms, black pepper broth and gremolata. The meat is divine and he even loves the mushrooms. High praise indeed! My husband has been transformed from from mushroom hater to mushroom lover in one easy step – what a dish! Of course, dessert is a no-brainer. We both go nuts for Gaytime Goes Nuts which is Christine’s spin on the best-loved Australian ice cream on a stick the Golden Gaytime. Golden Gaytimes are good but this dessert is just out of this world. I remember watching the contestants make this on Masterchef with awe and wonder. This dish is so sleek and simple, you would never know the serious skill and the complex components necessary to create it. However, once you bite into it, you can appreciate the subtlety and complexity of the dish all at the same time. The saltiness of the hazelnut caramel, the sweetness of the caramel parfait, the coolness of the honeycomb ice cream and best of all, the yummy chocolate crunch. It’s the perfect way to end the night’s eating adventure. And just as a by the by, last time I wore this dress, I was fine dining at Paramount in London. Now I’m wearing it at Universal in Sydney. Same dress, different restaurants, but both named after famous film studios! Strange but true!